Kick off your visit on the 28th (Fri): take some stellar pictures from Main Tower, then explore the world behind art at Staedel Museum, and then contemplate in the serene atmosphere at Cathedral of St. Bartholomew (Dom St. Bartholomaus). To find ratings, other places to visit, more things to do, and other tourist information, refer to the Frankfurt trip website . If you are flying in from Brazil, the closest major airports are Frankfurt am Main Airport, Frankfurt-Hahn Airport and Cologne Bonn Airport. In June, daily temperatures in Frankfurt can reach 28°C, while at night they dip to 15°C. Cap off your sightseeing on the 28th (Fri) early enough to travel to Berlin. Berlin is known for museums, historic sites, nightlife, parks, and shopping. Your plan includes some of its best attractions: get a sense of history and politics at Reichstag Building, examine the collection at Topography of Terror, admire nature's wide array of creatures at Zoo Berlin, and appreciate the history behind The Holocaust Memorial - Memorial to the Murdered Jews of Europe. For more things to do, where to stay, photos, and more tourist information, use the Berlin trip planner . You can fly from Frankfurt to Berlin in 3 hours. Other options are to take a train; or drive. Finish up your sightseeing early on the 3rd (Wed) so you can travel to Amsterdam. Amsterdam is known for museums, nightlife, parks, breweries & distilleries, and shopping. 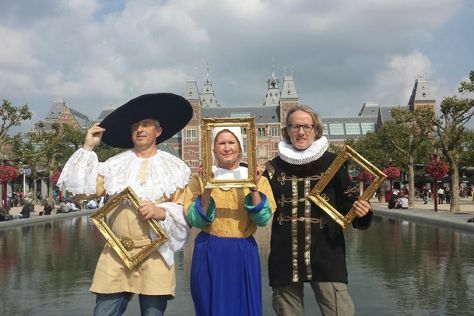 Your plan includes some of its best attractions: explore the world behind art at Van Gogh Museum, take an in-depth tour of Anne Frank House, explore the engaging exhibits at NEMO Science Museum, and steep yourself in history at Museum Het Rembrandthuis (Rembrandt House). You can fly from Berlin to Amsterdam in 4.5 hours. Other options are to do a combination of flight and train; or drive. In July, daytime highs in Amsterdam are 26°C, while nighttime lows are 16°C. Wrap up your sightseeing on the 7th (Sun) early enough to travel to Rome. Rome is known for historic sites, nightlife, museums, classes, and shopping. Your plan includes some of its best attractions: delve into the distant past at Colosseum, don't miss a visit to St. Peter's Basilica, stroll the grounds of Catacombe di San Callisto, and admire the landmark architecture of Pantheon. Plan a Rome trip in moments using our itinerary builder. Traveling by flight from Amsterdam to Rome takes 5.5 hours. Alternatively, you can do a combination of flight and train; or drive. Expect a bit warmer temperatures when traveling from Amsterdam in July; daily highs in Rome reach 37°C and lows reach 24°C. Wrap up your sightseeing on the 11th (Thu) to allow time to take a train to Florence. Dedicate the 13th (Sat) to wine at some of the top wineries in the area. The adventure continues: admire the masterpieces at Uffizi Galleries, take an in-depth tour of Basilica di Santa Croce, see the interesting displays at Academy Of Florence Art Gallery, and take in the spiritual surroundings of The Baptistery of St. John. For other places to visit, maps, reviews, and tourist information, read Florence trip itinerary tool . Getting from Rome to Florence by train takes about 2 hours. Other options: drive; or fly. Traveling from Rome in July, Florence is slightly colder at night with lows of 21°C. 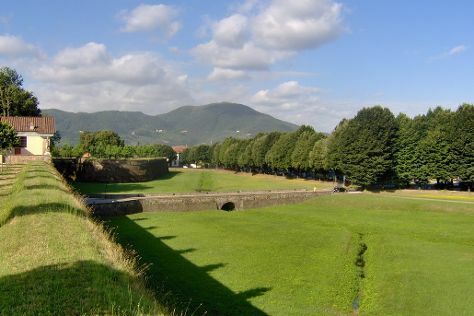 Wrap up your sightseeing on the 15th (Mon) early enough to drive to Lucca. On the 15th (Mon), don't miss a visit to Piazza dei Miracoli, then steep yourself in history at Le mura di Lucca, and then enjoy breathtaking views from Guinigi Tower. To find ratings, other places to visit, reviews, and tourist information, use the Lucca trip itinerary maker tool . Getting from Florence to Lucca by car takes about an hour. Other options: take a bus; or take a train. In July, daytime highs in Lucca are 35°C, while nighttime lows are 21°C. Wrap up your sightseeing on the 16th (Tue) to allow time to travel to Barcelona. Spend the 19th (Fri) among aquatic life with a scuba or snorkeling tour. There's much more to do: admire the landmark architecture of Basilica of the Sagrada Familia, pick up some local products at La Boqueria, make a trip to Las Ramblas, and appreciate the history behind Casa Batllo. To see other places to visit, more things to do, where to stay, and more tourist information, refer to the Barcelona online tour itinerary planner . Fly from Lucca to Barcelona in 5.5 hours. Alternatively, you can do a combination of bus and flight; or drive. Plan for somewhat warmer nights when traveling from Lucca in July since evenings lows in Barcelona dip to 25°C. Wrap up your sightseeing by early afternoon on the 20th (Sat) to allow enough time to travel back home.